More ergonomic product handling for every product type and in many different work environments. A vertical storage system to save space. 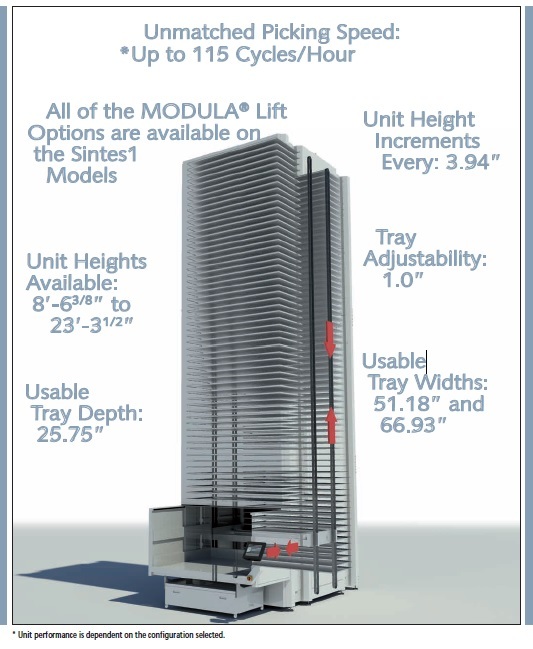 Moreover, the Modula Lift is an evolutionary breakthrough from the previous model and is able to store and pick items, components, and semi-finished or finished products of any type, thanks in part to the unit’s storage capacity – 154,000 lbs maximum unit load capacity and the ability to consolidate over 9,000 square feet of static storage into a unit footprint of only 158 square feet. 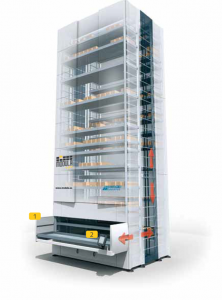 With unit heights up to 46 feet tall, the Modula Lift optimizes the vertical storage space within a facility and allows for work to be completed efficiently, with a very high picking speed. The Modula Lift has been designed to have a modern and attractive appearance, while having a robust frame structure composed of steel load-bearing profiles, fully welded and reinforced storage trays, and modular exterior steel cladding panels all produced using fully automated production processes. Internal or external picking bays, with single or dual level delivery. The Modula Lift’s structure provides storage for steel reinforced trays that are picked and deposited to picking bays by an automatic lift platform. The unit’s functions are completely managed by an innovative hardware and software system integrated into the unit’s controller, allowing users to easily manage and perform fast and efficient storage operations. 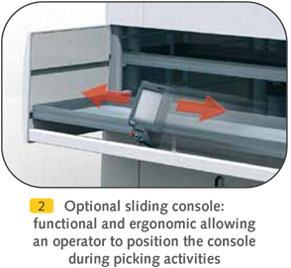 The external picking bay provides maximum performance thanks to the ergonomics of the working space and also increases the overall safety level to operators. The external bay also provides the ability for overhead picking, allowing for the use of external picking aides, such as robotic manipulator arms, cranes, etc. to more ergonomically handle products. (The smaller unit footprint required for units with an internal picking bay can further recover valuable floors space if the available area is particularly narrow.) 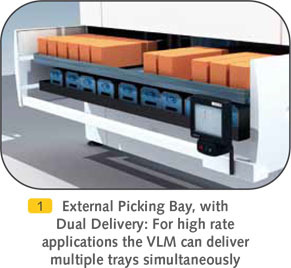 Internal or external picking bay units equipped with dual-level tray delivery provide a very high picking speed, eliminating operator wait time between picks. While the operator is picking product from one tray, the unit automatically retrieves and stages the next requested tray and then delivers it to the second delivery location. Operators are then conveniently guided in picking and replenishment operations by the unit’s color touch screen console. Click here for additional specifications info. The Modula Sintes1, a vertical lift module that can revolutionize your warehouse by saving up to 90% of the floor space currently occupied by traditional storage methods, is adaptable and flexible to any working environment – and is ideal for regaining floor space with a cost-conscious solution. 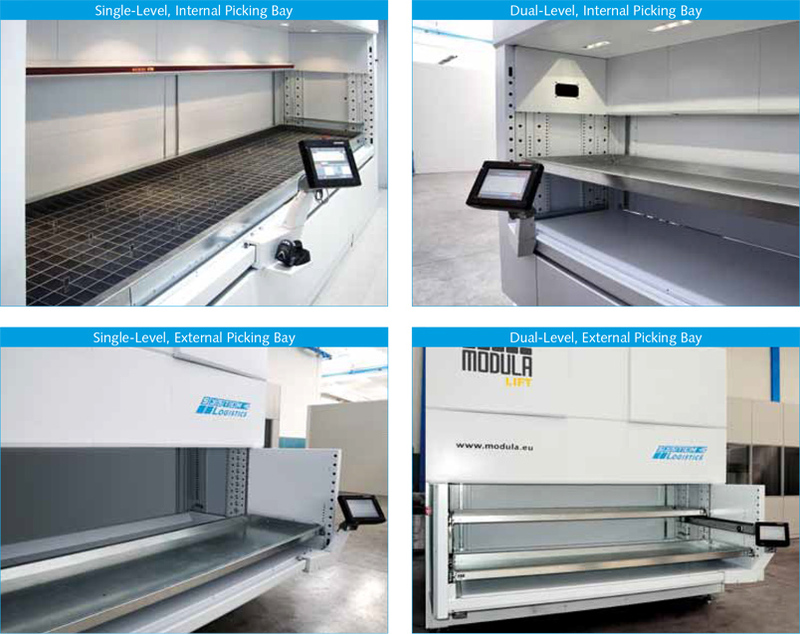 The Modula Sintes1 is the ideal VLM for storage and retrieval of small items such as electronic and pharmaceutical components, or other small tools, optimizing the storage space available while allowing operators to achieve unmatched picking rates. It can easily be installed in any industrial environment, shop, parts depot, distribution center or warehouse, and its small footprint allows you to adapt it to your operation, even where warehouse space constraints are present. No Compromise on Efficiency Every item stored within the Modula Sintes1 is able to be tracked efficiently, allowing operators to save valuable time with this functional and ergonomic VLM system – all without sacrificing efficiency or optional features offered on even the most advanced warehouse systems. To read an Outsource Equipment Blog post comparing Vertical Lift Modules and Vertical Carousels, click here. And when you’re ready to purchase or lease our vertical lift storage systems, Outsource Equipment is a leader in new and used warehouse vertical storage systems, specializing in both the vertical lift module and vertical carousel applications.